Hopefully there’ll be more celebrations on Saturday (Photo: nordphoto). Florian Kohfeldt wants his team to approach this Saturday’s home match against Borussia Mönchengladbach with courage – doing so will help Werder get back to winning ways. Coach Florian Kohfeldt believes that the Green-Whites have learnt from back-to-back Bundesliga defeats and are ready for their next opponents. On Saturday at 15:30 CET, the Foals, who recently lost to Freiburg in the Bundesliga and 5-0 to Leverkusen in the Pokal, will travel to the Weserstadion. The last game: Last season, SVW were unable to score against Borussia Mönchengladbach at home as they lost 2-0. Lars Stindl and Oscar Wendt scored in the first half as they scored the only goals of the game. 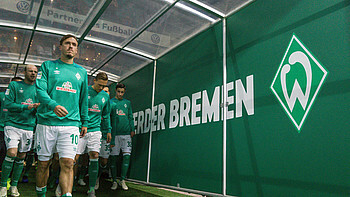 In the second half, Werder tried everything they could to score but were unable to change the final result. In the second game, a Dennis Zakaria goal and an own goal by Niklas Moisander once again put Die Fohlen 2-0 up. However, this time Werder were able to bring the game back to 2-2 through Thomas Delaney and Aron Johannsson, an important point in the relegation battle. The head coach on the game: Florian Kohfeldt sees Borussia Mönchengladbach as a strong opponent. “Gladbach are incredibly flexible. They attack with patience, have lots of quality on the wings and are also good on the counter,” explained the Werder coach on Thursday. Gladbach are also very stable in defence. “Off the ball, they press their opponents very well,” analysed Kohfeldt. The last games have showed that there are phases in which the opponents will be exhausted and gaps will appear. Therefore, on Saturday it will be important that we are “very brave with the ball, trust each other and combine well together. Then we will create chances,” said the head coach. Personnel: Maximilian Eggestein has been given the all-clear to play. The midfielder had to end training early after going into a hard challenge, but the 22-year-old is not injured and already has returned to training. Florian Kohfeldt has the whole squad available to him. For 20 years, this game has had at least one goal (Photo: nordphoto). Record: The head to head statistics between the two clubs are very balanced. SVW have won 38 times against Gladbach, with 27 of these being at the Weserstadion. Gladbach meanwhile have been victorious 37 times and scored 165 goals in their 98 games against SVW. Werder have only won one of the last 11 games against Gladbach. Werder’s record goalscorer Claudio Pizarro has scored seven goals in ten games against the upcoming opposition. Goals are guaranteed in this game and the last time there was a goalless game between these two teams was in 1998. The opponent: Borussia are certainly one of the surprise teams after the first ten games and are currently on 20 points, only behind league leaders Borussia Dortmund and are ahead of Bayern München. Dieter Hecking’s XI have won three of their last four games and are unbeaten at home. Away, however, they only have five points and are in 11th place in the away game’s table.